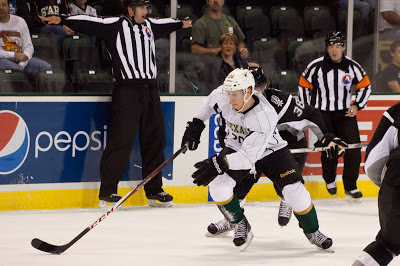 The Texas Stars announced their opening roster for the 2012-13 season. Honestly, there were no big surprises on the roster because nothing changed. Texas has decided to keep a few more bodies around to start the season because of the unexpected depth in the AHL this season. The team doesn't feel that it would make sense to send down some of the bubble players only to potentially have to call them back up again in a week for depth during the three-in-three. GM Scott White is hedging his bets on the lockout ending soon as well with the move. If movement has to happen fast, it will be easier if all of the bodies are here in Cedar Park already. Maintaining the roster as-is means that both Cam Barker and Taylor Vause have been signed to professional tryout contracts. PTOs are 25-games in length and can be terminated at any time by the team. A PTO is a great thing for Barker. After the first, you are allowed a second 25-gamer. That takes the deal all the way to February 15th. By that time a decision will surely have to be made on whether the 2012-13 NHL season is completely cancelled. That timing works out well for Texas because there is no such thing as a third PTO. After the second, the player must be signed to a standard contract or released. With the NHL cancellation decision made at that point, it would be easy to decide on an SPC for Barker. Vause is another good story. He clearly spent the summer training up and getting ready for this year knowing that he would have a very tough time getting in because of the lockout's trickle-down effect. He made it and that's quite an accomplishment. At times, I believe Vause looked better on the ice than Dallas-contracted players like Austin Smith. Both played four years of hockey before this, but Vause played in the WHL and Smith in the ECAC of the NCAA. Smith has commented that he is working on learning systems more because his role on the Colgate Raiders allowed him to "go wherever he wanted" on the ice. Perhaps the WHL's more structured style allowed Vause to make a smoother transition to the professional game. There is no doubt that there are hints of a spark in Smith's game, but it seems that learning the defensive side might be holding back his offense a bit overall. However, comparing the two alternatives, playing defense and not scoring goals or concentrating on offense and getting a nasty plus-minus, you're sure to get farther with Coach Desjardins and Scott White doing the former, not the latter. Each night Coach Desjardins will have to pick three of these players to make up his fourth line. It's a tough challenge because each player brings a different element. Even just the first three versus the last three is a completely different look for the fourth line. Tough decisions to be made. That's nine bodies on the blue line, by the way. What a huge group. Hubert Labrie and Jace Coyle have to be destined to Idaho shortly, in my opinion, and they will probably sit most nights in Cedar Park until that happens. The thorny issue is who the 7th man is. Some argument could be made that Nemeth should be that man some nights, given that he is making the adjustment to North American hockey and may have a longer development curve than Oleksiak. After that, it's a toss up to me of Barker and Benn. You don't want to sit either because they are both great veterans. It will be interesting to see the opening lineup on Saturday. No big surprises in net as Jack Campbell and Cristopher Nilstorp will man the pipes.